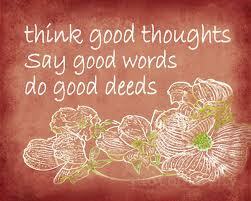 HomeBlogDoes the Zarathushtrian religion teach only Good Thoughts, Good Words, Good Deeds? Roj Fravardin, Mah Adar, 1377 Yz. Very often we hear anybody and everybody repeating this line: ‘Our religion is very simple – Good Thoughts, good words and good deeds’. But how many Parsis have stopped to wonder on what these words really mean? Is religion only about this? Does the Zarathushtrian religion have a monopoly on good thoughts, words and deeds? Do other religions not teach the same thing said in maybe a different manner? Then why do we harp on these words? Every creation of the supreme Lord Ahura Mazda, including each man and woman on this earth has been given a specific divine task by the Creator to perform at various stages of existence. Yet caught in the whirlwind of daily life, man forgets this onerous responsibility and instead concentrates on his worldly pursuits. The frailties of his physical body compel him to commit sins which take him even further away from God and deaden his mind from thinking about his ultimate goal – salvation. The question arises: how should man concentrate on his spiritual responsibilities without losing track of his secular liabilities? The Zoroastrian scriptures reveal that the solution lies in following the practice of Meher-Patet. Meher signifies absolute truth, and Patet signifies the practice of immediate and public acceptance of a wrong doing. How does this help? Meher is also the Yazata or divine entity connected with the sun’s rays. The rays of the sun engulf the entire earth and every atom of man’s body craves for the life-giving properties of the sun. When man follows the practice of Meher-Patet, the life force of Meher, present in the sun’s rays, infuses through his body and alerts his consciousness towards the spiritual responsibilities. Thus roused, man opens the wide pastures of his body and soul for Meher Yazata to cultivate. Meher Yazata sows the seeds of goodness in the man, and fertilises his soul with the enrichment of physical, mental and spiritual wellness. This crop of spiritual awareness is then harvested by man and the fruits of his good labour accrue to him. He becomes aware that his deeds must not be just those driven by his personal needs, but should rise to the level of Hvarshta: Good Deeds, that is, those deeds which fulfil the divine task entrusted to him by his maker. Once man converts his deeds to Hvarshta, he becomes an associate of nature, attempting to help other entities in their divine tasks. As he understands more and more of the mysterious working of nature he realises the magnitude of the task entrusted to him. He observes the working of the Celestial Ones and decides to sing their praise rather than talk the normal human tongue. He gets more conscious of what and how he speaks, ultimately speaking less and praising the work of the divine ones through the Manthras more. The control over his tongue soon enables man to develop the power to bring his words to fruition. He thus transcends the level of mere speaking, and advances to the level of Hukhta: Good Words – that is, words which when spoken have the effect of immediately delivering what they promise. As he attains the stage of Hukhta, man comes into direct contact with the Celestial Ones and joins in their work. He realises that the entire creation works according to the Ahuna Vairya: The Divine Thought and Will of Ahura Mazda. His entire mind becomes focused on how to further the Will of the Creator. He realises the futility of harbouring other thoughts, and hence begins the process of cleansing his mind and thought process. After long practice and help from the Celestial Ones, man gains control of his diverting and hyperactive mind and removes all extraneous thoughts from it, replacing them with just one central and over-arching thought: `how shall I further the Will of Ahura Mazda?’ As his mind is cleansed, it becomes the abode of Vohu Mana: the Good Enlightened Mind, and his thoughts transcend the temporal and attain the state of Humata: Good Thoughts. This is real meaning of the oft quoted phrase Humata, Hukhta and Hvarshta, wrongly used to describe the so-called adage of the Zoroastrian religion: good thoughts, good words and good deeds. Since our current thoughts, words and deeds are far from reaching that state of perfection, we need to adopt the path shown by the Prophet Zarathushtra: cultivating the habit of truthfulness at all times, and developing the moral courage to publicly accept when we go astray from this difficult practice. Is gambling considered to be a sin in our religion? If yes, then why? If you would have to put down the Zarathushtrian commandments (like the 10 commandments of Christianity), what would the commandments be, besides Good Thoughts, Good Words, Good Deeds? Gambling is considered as a sin because there is expectation of a large reward without putting in commensurate amount of effort. A reward without work is not considered just.